According to Ayurvedic medicine, a form of alternative medicine that originated in India 5000 years ago, keeping the head cool can prevent hair woes like graying or balding. Ayurveda also suggests specific herbs to promote hair growth and prevent problems. NaturallyCurly.com talked to Nicole Hinterstocker, an Ayurvedic practitioner and owner of Ajara Ayurvedic Beauty, for tips on creating an Ayurvedic hair regimen. Ayurveda offers an alternative model of biology where everything is made of five elements: ether, air, fire, water, and earth. An Ayurvedic hair regimen uses cool, soothing herbs to calm the scalp and promote hair growth. The theory is that if someone is bald, it’s because they burned all their hair away, so Ayurvedic tradition encourages keeping the scalp cool. Bone health is also believed to improve hair health. In lieu of traditional shampoo, Ayurveda followers wash their hair with a tea made from a blend of herbs found in powder form. While the tea needs warm water to steep, Hinterstocker cautions that in keeping with Ayurvedic principles, you never want to use hot water on your head. “Use the lowest temperature that’s still comfortable for you,” she says. 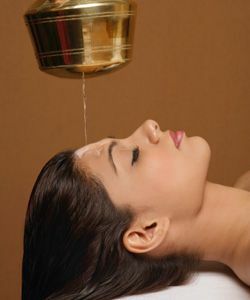 Next, the Ayurvedic hair regimen involves applying oils to the scalp and lightly through strands of hair. The choice of oil depends on the individual’s hair. Another commonly used herb, Bhringaraj, which means “king of the hair” in Sanskrit, is believed to promote hair growth and reduce hair loss. Hinterstocker says she’s seen major hair growth while taking Banyan Botanical’s healthy hair tablet, which contains a proprietary blend of Bhringaraj, Brahmin and hibiscus, among other ingredients. The ritual ends by scenting the hair with a cooling incense such as benzoin, which acts as an antibacterial agent, or amber, which promotes cell respiration and regeneration. “When you burn amber, some of the oils will land on the hair and scalp itself, therefore working its way into our systems through our skin,” adds Hinterstocker. Try conditioning your hair with Ayurvedic herbs after your henna hair coloring treatment. Watch tons of natural and curly hair videos, product reviews, curl stories and more at NaturallyCurly's YouTube Channel!